MSM (Methylsulfonylmethane), is a source of naturally-occurring sulfur. This popular dietary supplement has now been formulated into a nutrient-enriched, moisturizing cream. We've blended soothing emollients,such as Jojoba Oil ans Sweet Almond Oil, with Collagen, Aloe Vera, and the Vitamins E, A and D. This combination of beneficial vitamins, oils and herbs work together to soften, smooth and moisturize the skin. Gently massage MSM Cream into the skin as required. Caution: Do not apply to broken or irritated skin. 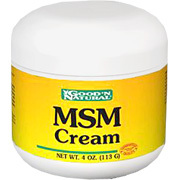 MSM Cream is shipped in a discrete, unmarked package. Orders are processed immediately and usually take about 3 to 5 working days to be received. We do ask that you try it for 2 to 3 weeks to feel the full effects. Any information received is used only for order processing and shipping purposes. Your information, such as e-mail address, will never be disclosed to a third party.